Reduces oil and fuel consumption! Also use to extend the life of small 4 cycle engines such as; lawn maintenance equipment, motorcycles, snow mobiles, etc. LUBEGARDÂ® ENGINE OIL PROTECTANT contains Liquid Wax Ester (LXEÂ®) Technology, the lubrication system of the future. Specifically formulated to minimize friction and wear, also to keep the oil cooler in todayâ€™s more complicated engines. All modern engine oils contain a highly refined petroleum or synthetic base oil which is fortified with additives to meet motor oil performance specifications. Even so, dated specifications may not represent the level of performance needed by a new engine design. A new oil may not contain sufficient additives such as ANTI-WEAR agents or ANTI-CORROSION compounds even though it passes all the tests. Furthermore, these protective compounds are depleted when the oil is in service. The solution to this protection gap is LUBEGARD ENGINE OIL PROTECTANT which supplements and enhances the effectiveness of the additive system already present in the oil. LUBEGARD replaces the depleted or insufficient additives and adds LXEÂ® wear protectors and friction reducers which are unavailable in any oil. Minimum friction means maximum mileage; minimum wear means maximum service. In addition, LUBEGARD increases the thermal and oxidative stability of motor oil to prevent creation of sludge and deposits. 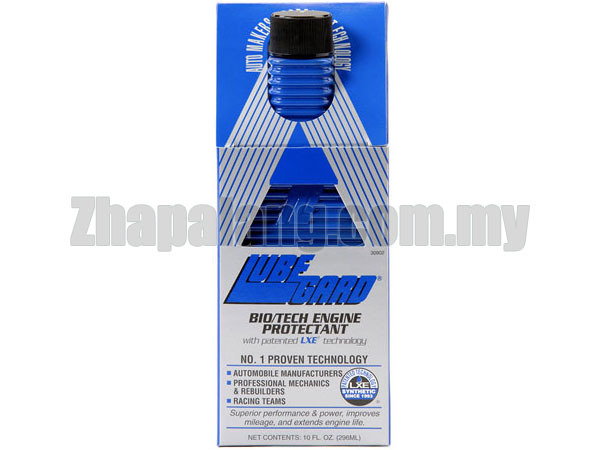 LUBEGARD with LXE Technology will carry your engine through to the future! The motor oil with the addition of LUBEGARD Bio-Tech Engine Protectant increased the oxidative stability of the untreated motor oil from 248 minutes to 349 minutes. This improvement in oxidative stability (29% improvement over untreated motor oil) is far greater than any of the other tested additives. When you start your engine in the morning, it runs for up to 60 seconds on the oil film left from the night before. Scientific studies in operating engines have shown that the wear rates are close to 50 times greater during starting than during running. LUBEGARDÂ® Bio/Tech Engine Protectant helps improve the protection of the oil film against wear start after start, as well as reducing friction and wear when the engine is running. Lowering friction within the engine restores lost energy to you in the form of improved gas mileage and higher performance when you need it most. Pictured are steel pins from a Falex Pin and Vee Block test simulating start up conditions in motor oil. The Falex Pin and Vee Block test measures the sliding friction and wear of a round metal cylinder on flat metal block surfaces. Sliding friction is the major type of friction and wear in engines. The test pictured was run only for analysis of friction and wear of individual oils with and without LUBEGARDÂ®. Note: International Lubricants, Inc. does not compare, endorse, or advise comparison of any brands of motor oil on the basis of these tests. Independent testing by one of the industryâ€™s most renowned and respected institutions. Swissmotor, (Switzerlandâ€™s cross-version of AAA meets Car and Driver) did their own independent and unsolicited research and field testing on LUBEGARD products, including the Engine Oil Protectant. Read their amazing field tests and results in the full story here!